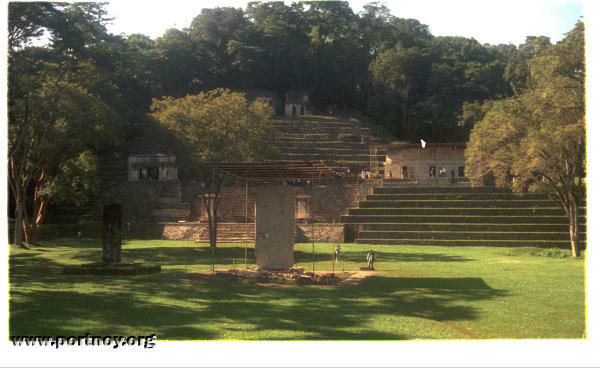 Bonapak is a small site near Yaxchilan, which has been difficult to access until very recently. It contains the only known example of surviving painting in the Mayan world. It is likely that many interior walls and monuments were painted, but that the paint has degraded over time in the hot, humid climate. The murals at Bonampak survived and were discovered in 1946. The three rooms at Bonampak portray a great battle, with each room depicting a stage of the war -- the preparations before, the battle itself, and the sacrifice of their captured opponents. The murals cannot be photographed, but several books include full-color reproductions. The colors are bright and clear, the details very realistic.